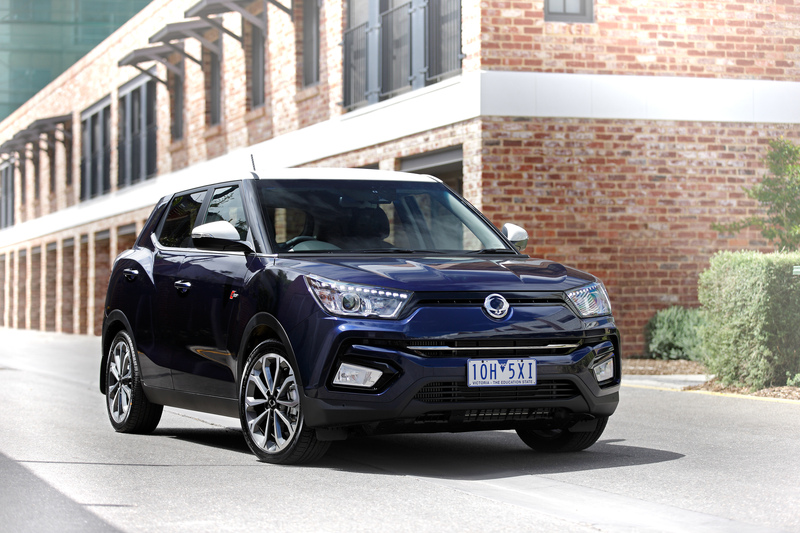 Loaded with style, safety and suitability, the all-new SsangYong Tivoli is now on sale in Australia. Tivoli will come with seven airbags including front, side and curtain airbags plus a driver's knee airbag, Electronic Stability Program (ESP), Active Rollover Protection, Brake Assist, Hill Start Assist and Emergency Stop Signal, reversing camera and rear parking sensors. As well, every version of Tivoli will come standard with Autonomous Emergency Braking (AEB), Lane Departure Warning System (LDWS), Lane Keep Assist (LKA) and High Beam Assist (HBA). Tivoli was the first new model to be launched following the merger of SsangYong and Mahindra & Mahindra and was the result of 42 months' development and an investment of 350 billion Korean won (440 million AUD). For those customers needing practicality, Tivoli provides one of the largest cabins and boot volumes in class, with a generous number of storage spaces. It will launch with eight exterior colours and a two-tone palette will be an option for fashion-conscious customers. This all-new car takes its name from Tivoli, the Italian town near Rome with a reputation for style. Noted for its cultural heritage and beautiful location, the gardens at Villa d'Este have inspired others to use the name, including the Tivoli Gardens in Copenhagen. For SsangYong, the new Tivoli is designed to provide inspiration and excitement with style and performance. Under development for three years and seen as a series of five XIV concept cars exhibited at four international motor shows, Tivoli features a dynamic, urban look with a contemporary silhouette, and embodies the rhythmical motion of SsangYong's design language, 'Nature-born 3 Motion' - Rhythmical, Dynamic and Dignified. Inspired by contemporary city architecture, the car's beautiful lines also reflect the fluidity found in nature. The front of the car conveys a strong and purposeful look. The width is emphasized by its slim-line grille through to the headlights, which together have been inspired by a bird's wings in flight. While the front bumper communicates strength, particularly emphasized by its dynamic air intake, the bonnet line is softer in character and stretches widely. In profile, the car's rhythmical character flows through to the rear bumper to give a voluminous and strong stance, complemented by 16" or 18" alloy wheels. The wide C pillar is another design cue endorsing SsangYong's reputation for strong, powerful SUVs, while the chrome line detailing that flows from around the rear door, across the front door, and around the rear of the bonnet imbues Tivoli with a premium and sporting tone. At the rear, the balanced and well-proportioned look continues Tivoli's confident, youthful image, with the rhythm continuing through the rear light units to link the side and rear in harmony. The rear bumper provides a strong base, above which sits the wide opening tailgate, and below, the centrally mounted rear fog lamp. The interior offers the modernity of a luxurious living space, with a stylish and contemporary look. Designed to offer driver and passengers easy connectivity to their IT devices, it also brings style, practicality and plenty of storage space with an interior width of 1,795mm. An ergonomically designed D-shaped sports steering wheel affords a comfortable grip, while the premium leather covering gives a premium, tactile feel. The cylindrical-shaped instruments enhance the driver's focus and motoring pleasure, while the cluster illumination can be personalised to any of six subtle background colours: red, blue, sky-blue, yellow, white and black. Semi-bucket style seats are ergonomically formed with two levels of firmness to provide superb comfort and postural stability. Designed with passengers' complete comfort in mind, the car seat function and materials have been carefully selected to create a sports car look and feel: reclining and adjustable, with premium touch materials with a quality quilt stitch design for an air of exclusivity. The second-row seats are inclined at an angle of 27.5 degrees, and the near flat floor ensures rear seat passenger comfort even on long journeys. The rear seats also offer various folding combinations including fully level and a 60:40 division. Tivoli also provides numerous storage spaces in different parts of the car including the centre console (large enough for an iPad), the glove box and inner tray, an open tray and luggage tray. There's also space to carry a 1.5-litre drink bottle in each of the front and rear door side pockets. The new powertrain of the Tivoli has been designed to be compact, highly efficient and reliable, with a choice of 1.6-litre petrol or diesel engines. The e-XGi160 petrol engine delivers 94kW max power with 160Nm of torque, offering optimised performance for both urban and highway driving with excellent NVH characteristics. The e-XDi160 diesel engine produces 84kW at 3,400~4,000rpm, with maximum torque of 300Nm available from just 1,500 rpm for a powerful and sporty driving performance. The Smart Steer system on Tivoli offers three different steering modes - Normal, Comfort and Sport. Depending on preference, the driver can adjust the steering feel according to the driving conditions, and offers different settings for safe, comfortable steering when parking, slow speed and stop/start city driving, or high-speed motorway cruising. Tivoli is also fitted with an electronic power steering system, which helps reduce steering effort while also minimising power consumption by ensuring that the motor is only activated as required. The Tivoli is equipped with McPherson struts to the front wheels – mounted to the front sub-frame for greater strength and safety – with coil springs for great ride comfort and high-speed stability. At the rear, there is Torsion beam suspension with rear mounted springs, which is light yet durable, affording smooth and stable driving, while the AWD model comes with a multi-link suspension. An insulated double skin bulkhead between the engine bay and cabin also minimizes the ingress of engine noise. Drawing on SsangYong's 4x4 DNA, the option of a smart all-wheel drive system will be available on the Ultimate version. The electronically controlled on-demand system distributes power to front and rear drive shafts, and automatically adjusts to the road surface and driving conditions to optimize performance. In normal driving, the drive system distributes all power to the front wheels to enhance fuel efficiency, and automatically adapts to all-wheel drive in wet, slippery conditions, by diverting power to the rear wheels as well to ensure driving stability. For increased stability and reassurance, particularly when driving on a hill or slope, the all-wheel drive operates with Hill Start Assist, which helps by delivering power to any wheels that are spinning. And for optimized braking performance, ESP and ABS also control the AWD system for greater safety. With its advanced all-wheel drive system Tivoli offers a highly competent off-road capability. With 167mm ground clearance, approach angle of 20.8 degrees, 28.0-degree departure angle, and 18.7-degree ramp angle, effective performance for venturing a little off the beaten track. Tivoli is built to an extremely high level of strength and safety, and 71.4% of its body construction uses HSS (High Strength Steel) of which some 40% comprises AHSS (Advanced High Strength Steel). Other key safety features include Electronic Stability Program (ESP) which constantly checks a host of functions - vehicle speed and balance, engine power, pedal use and steering angle, and controls the engine and brakes when a driver begins to lose control due to weather conditions or sudden cornering. The Active Roll over Protection (ARP) and Brake Assist System (BAS) prevent a vehicle from rolling over when cornering suddenly at high speed, and increases the braking force when a driver is unable to apply sufficient pressure on the brake pedal in an emergency situation. EBD-ABS (Electronic Brake-force Distribution and Anti-lock Brake System) distributes the braking force of the front and rear wheels according to the number passengers and load weight, while the Full Traction Control System prevents tyre slip by controlling the brakes and engine. Every model in the Tivoli range comes with autonomous emergency braking (AEB), forward collision warning (FCW), lane departure warning (LDW), lane keep assist (LKA) and high beam assist (HBA).